← This Journey’s Far From Over! Happy weekend, Friends! Thought you might enjoy this healthy recipe I acquired from a cooking class I recently attended with my Bolder Options mentee. It was a great class and the pancakes turned out fantastic. Because of the content variation, these pancakes are heavier, more dense than the standard recipe. I appreciate they contain oatmeal and whole wheat flour…helps us feel fuller, longer. I also like the substitution of applesauce for syrup. The true test came at home, as my husband and son both liked them. 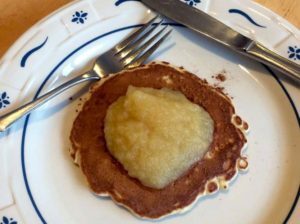 Though they used syrup instead of applesauce, I was happy I could eat the same meal with a simple, lower-calorie modification. Give this recipe a try! 1. Combine the oats with milk in a large bowl, let stand 5 minutes. 2. Mix flour, sugar, baking powder and salt in a medium bowl, add to oat/milk mixture. 3. Beat eggs and oil together, add to mixture. 4. Stir just until all ingredients are combined; mixture will be lumpy. 5. Spread small amount of oil onto griddle or pan; heat to medium temperature. 6. Pour 1/4 cup batter onto hot griddle or pan for each pancake. 7. Turn pancakes when tops have bubbled and edges look cooked. 8. Serve sprinkled with cinnamon and topped with 1/4 cup applesauce. This recipe yields 12 pancakes. One serving equals 1 pancake and 1/4 cup applesauce for a total of 140 calories. This entry was posted in Healthy Eating, Recipes. Bookmark the permalink. I’m going to try this. I also like pancakes that take 1 egg and a smashed banana–that’s it. Try that one too. My kids liked it until they saw me making them once!